Welcome to the Council on Business & Society and the third issue of our improved, downloadable magazine Global Voice. What is Global Voice all about and why, indeed, should we recommend you read it? Global Voice is a quarterly online publication that gathers top articles produced by the academics of our member schools of business and management as well as invited experts from governments, NGOs, organisations and our knowledge partners McKinsey & Co and the OECD – all from a business and society perspective. Business and society in the sense that we believe companies can, and must, positively benefit not only their shareholders but their employees’ working conditions and career paths, the local community within which the company or organisation is located, society in a wider sense and, not least, the environment. Global Voice has a vocation to offer others the high-level research output of our educational institutions in a readable, enjoyable and practical style. It also aims to spark awareness on key issues challenging us today and provoke food for thought and debate. The magazine’s sections focus on business and society (including financial and cultural insights), leadership and management (including HR issues such as employee welfare and diversity), entrepreneurship, and sustainability. For professionals, these sections provide a look at future trends in business practice, new methods and ways of managing teams, and research into entrepreneurship and social entrepreneurship. For those working in education – teachers, trainers, consultants and faculty – our features can also be used for classroom study and debate. For students, our articles can offer additional knowledge that they can use to deepen their understanding and strengthen their assignments with. Enjoy issue #3 of Global Voice and don’t hesitate to send us your views and join in the debate! 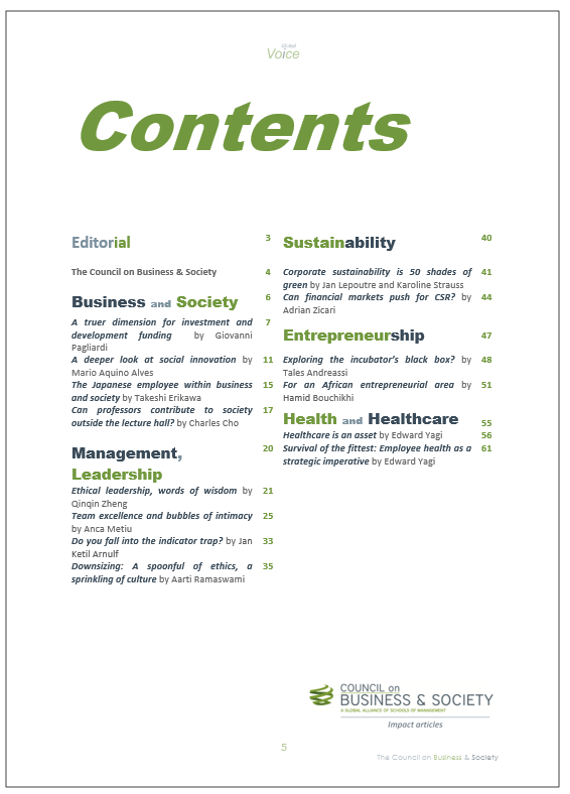 Download issue #3 from our Council on Business & Society website download page. ← Well-being or Being at Work?